With the ever-changing e-commerce industry demands, you need only the best of everything including the Shopify Apps to assist your e-commerce store. However, the only problem with finding the best Shopify apps that could boost your sales in 2018 is that there are thousands of options in the store. How will you pick one of the thousands? And more than that, can you afford to spend that much time in sieving apps? We guess, no. And that’s why we are here with a list of some of the best Shopify sales apps that you must integrate with your e-commerce store in 2018! Interestingly, this application is comparable to the much-missed factor of offline shopping and that’s ‘personal recommendations by the sales representative in a store’. When we dismiss a product for some reasons, the sales representative comes up with almost 4-5 similar options, or in case of finalizing a product, the representative comes with some complementary options such as a pair of socks when you buy shoes, increases not only the chances of converting that customer but also the average purchase value. Boost Sales will do the same thing for your e-commerce store. When your consumer will view or add an item to the cart, Boost Sales will line up similar products along with the complementing products to increase the cart value. Boost Sales analyzes the shopping data and on the basis of which products are often bought together or viewed together, it retrieves the items in a pop-up. The best part is that you can manually direct Boost Sales to schedule your preferred-upsell and cross-sell package deals. How much time do you put into creating and scheduling newsletters each week? That time can be reduced almost by 80% with Mailbot. All you have to do is the initial setup for rules, recommendations, email body, and subject libraries. Post that Mail bot will generate newsletters which will be personalized for each customer showcasing new arrivals, product recommendation, collection cross-sells, reminders, etc. Built intricately to give freedom to the store owners, Mailbot is one Shopify app that you must have because the personalized approach is something that is impossible to achieve manually and is definitely too important a strategy to not pursue. Yotpo is probably the most popular app used by the Shopify users. Social proof has become crucial for initiating a sales journey and customer review is the strongest driver of the buying journey. Yotpo reviews allows you to approach your consumers with a request for adding a review which is then displayed in a widget. It is a like a social badge of success which is bound to up the sales in no time. There’s nothing more annoying that notifications in the digital world and no e-store owner wants to do that to his customers. However, one pop-up notification that can reassure instead of annoying you consumers is that of a sales pop. This application pops real-time notifications to let the consumer know about the recent purchases of the item he is currently viewing which increases his confidence in the product. Sales Pop shows exactly what customers want to know by displaying how the other consumers are loving that product and are satisfied with the purchase. It is one of the most powerful selling tools that you could use in 2018 if you haven’t yet. We don’t need to stress on the importance of social media platforms, right? As e-commerce sellers, you must already know how social mediums have become the definite deciders of the quality of various services and products. And the intriguing part is that not just one, but all the social mediums are equally powerful in generating traffic and leads. This clearly suggests that your presence is crucial on all the mediums but it also adds a dilemma of ‘how to manage all the social mediums?’. Outfy is a Shopify app that flattens out all the social media woes of the e-commerce sellers. You can manage Facebook, Twitter, Instagram, Pinterest, and other 6 social platforms from one single dashboard. Moreover, you can plan social media posts for days, weeks, and months in advance which is a clear win for the store-owners. You’ll be glad to hear that Outfy also syncs the products every day to the dashboard which lets you use the latest products for marketing. So, which are the ones you are planning on integrating with your stores this year? We suggest, all! 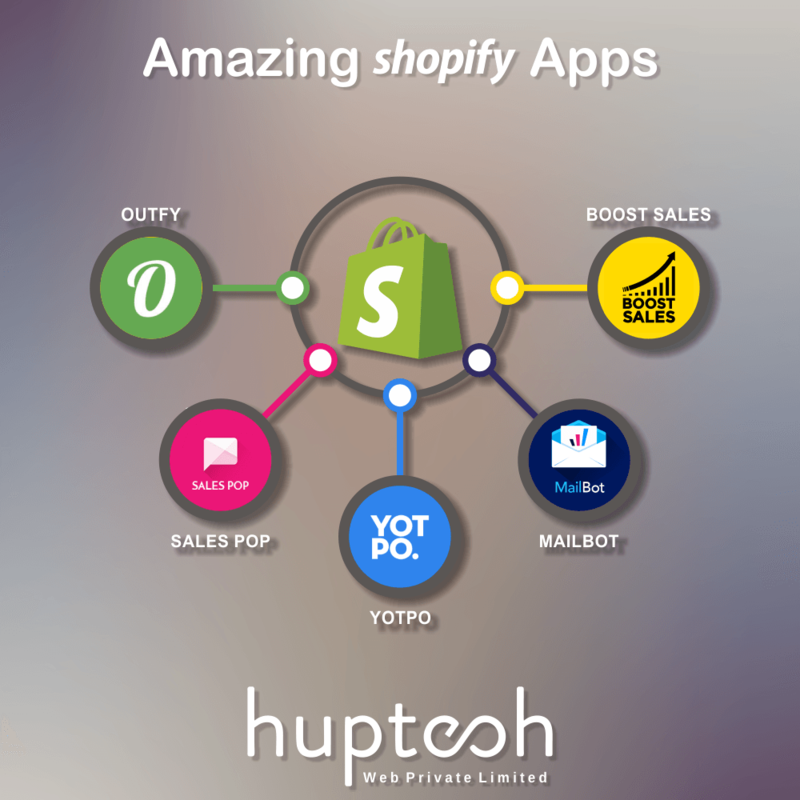 However, if you are looking for personalized interaction on which Shopify apps can increase your sales, send in your queries and one of our representatives will get in touch with you! Huptech is all set for assisting you in driving your e-commerce sales!